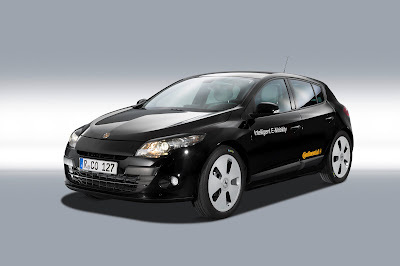 Continental is well aware of the trend toward electric transportation, as demonstrated by a car which has been converted from an ordinary conventional vehicle into an EV (Electric Vehicle) prototype. The company integrated around 40 of its EV components in the vehicle, including the motor, battery, power electronics, novel displays and controls, all the peripheral devices for propulsion and charging, and special Conti.eContact tires. Most of these components are ready to go into production or are already being mass produced. “All the know-how that has flowed from all five of our divisions demonstrates that Continental has the technologies and systems expertise for electric cars. This is particularly significant as electrification of cars is becoming more and more of a reality“, said Continental CEO Dr. Elmar Degenhart. The prototype is fully functional and has already logged over ten thousand kilometers, a testament to the work of Continental’s Systems & Technology Automotive department and in-house Engineering Services which built the prototype in a little over six months. 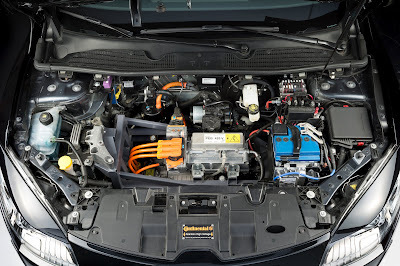 At the heart of the Continental prototype is an externally excited synchronous motor, the likes of which Renault has already fitted in thousands of its electric cars. The motor generates 70 kilowatts and maximum torque of 226 Newton meters, propelling the prototype from zero to 100 kilometers per hour in 11.9 seconds. Continental has been the only manufacturer to mass produce an externally excited synchronous motor in the automotive industry. The motor has several major advantages compared to permanently excited electric motors. Externally excited motors make for high efficiency throughout all ranges of operation. Particularly at high rpm‘s, regulation of the excitation current yields lower mutual inductance. This technical feature also serves to protect the motor. Yet another advantage is that no expensive rare earth metals are needed for the magnets. The electric motor is coupled to an integrated single-gear transmission and a differential that includes a mechanical parking lock, power electronics and an electric vehicle controller. The second-generation power electronics stem from a flexible modular system. Even with the built-in DC/DC converter, the unit is some 30 percent smaller than the first generation, making it one of the most compact components on the market. Automotive designers thus gain valuable space while reducing total vehicle weight and extending the range. The central control unit – the brain of an electric vehicle - is derived from a mass-produced engine control unit. It not only controls the drive mechanism but also manages temperature, energy and recharging. Power comes from a lithium-ion battery. Including its built-in management system, safety electronics, the innovative crash sensor evSAT, and liquid cooling, the system weighs 154 kilograms, allowing installation in a sandwich floor without sacrificing any space. There was no change to the trunk space or to the variability of the interior. The battery pack has a nominal voltage of 355 volts and a capacity of 18 kilowatt hours which gives the car a maximum range of 150 kilometers. An on-board charger by Continental, on the verge of mass production, recharges the battery. The charger features modular design and is scalable. It has been designed for electric cars and plug-in-hybrids – hybrid vehicles whose batteries can also be recharged from an outlet. The high capacity of 10 kilowatts means that it is possible to completely recharge the car in just over two and a half hours. Early on in the development process, a prototype high voltage junction box was created to guarantee that such high-demand devices as the charger, converter or heater had secure access to the power in the battery. It also secures and controls the plug connections and is able to temporarily switch off unnecessary components. Speedometers and tachometers are things of the past. With the advent of electric cars, drivers need other types of information. Easily understandable, but highly accurate information about energy reserves and remaining range is particularly important. The connected car of the future will be able to dispel fears about running out of electricity unexpectedly while on the road. Drivers will be able to consult a freely configurable instrument cluster to obtain information on the remaining range based on such data as energy flow, charge state, active radius and current traffic conditions. A 12.3-inch LCD screen, similar to the display on a tablet computer, will notify drivers at a glance of all pertinent parameters. Depending on the purpose and the operating status, drivers will be able to obtain trip and battery data, navigation tips, tips on saving energy, or even find the nearest recharging station. Developers have left a lot of room available for individual configuration of information requirements. Another innovation in the electric demonstration car is its active accelerator pedal, the Accelerator Force Feedback Pedal (AFFP®) by Continental. It is the world’s first mass-produced active accelerator pedal. Its built-in actuator and completely programmable haptic feedback signals offer entirely new ways of helping drivers to travel as economically as possible. Depending on the driving program chosen, it will be possible to select a variable pressure point along the pedal in order to signal the most economical pedal position to the driver, for example. At the same time, it will be possible to increase pedal resistance in relation to the charge remaining in the battery in order to signal diminishing range and the need to drive more economically. Since such feedback can also help decrease fuel consumption on cars with internal combustion engines, and since the Accelerator Force Feedback Pedal (AFFP®) can serve as a warning signal for impending danger, its use is not just confined to electric vehicles. Continental, however, is thinking way beyond the cockpit when it comes to the Human-Machine-Interface (HMI) for electric cars. For its prototype, the company developed an innovative recharging socket that informs the owner at a glance of the car’s current status. Not only is it illuminated white so that drivers can recharge at night with ease, a blinking LED ring also indicates the charging status: a change from yellow to green indicates how far recharging has proceeded. Continental has also developed an Internet-based portal for electric cars that will allow drivers direct access to their cars from their home computer or smartphone. Just a few clicks of the mouse and drivers can see how much the battery is charged or how much more time remains before charging is completed. In the future, it will even be possible to manage recharging and the air conditioning. For example, it will be possible to start recharging at night when electricity rates are lower, or start the air conditioner to cool the car down as long as it is still plugged in. Mainly responsible for the gain in distance is the unusual tire diameter. Deformation decreases when the tire approaches the contact patch, resulting in greatly diminished resistance to rolling. At the same time, the same load bearing is possible as with ordinary tires. In addition, Continental has formed the sidewalls so that less energy is lost when the tires deflect or top out. The sidewall dispenses with the usual edging and design elements, just like the very smooth and largely enclosed rims, in order to diminish wind resistance as much as possible. The tread design features a combination of four longitudinal grooves, numerous sipes, an absence of transverse corrugations, and stiff tread ribs, all trimmed to provide lessened resistance to rolling and less tire noise. It was also possible to achieve precise handling characteristics and safe braking under wet conditions. The very low tire contour prevents excess travel by the belt elements and therefore lowers resistance to rolling. Finally, the new tire is lighter than previous designs. Recuperation is essential for an electric car. An internal combustion engine provides some braking power to assist conventional braking systems. Intelligent control of the generator has contributed to better mileage only within the past few years. However, it is indispensable for increasing the range of an electric car. Each time the car slows down without applying the brakes, valuable energy flows back into the battery, increasing the car’s active radius. The Continental electronic brake system ESC MK 60, already found on more than 50 million conventional cars by a variety of manufacturers, determines the braking strategy in the Continental prototype. It controls such central functions as the electronic stability program, the ABS, traction control or hill holder. Continental widened the control unit’s array of functions for deployment in an electric car. It determines the safest interplay between recuperation and conventional braking by considering the gas and brake pedal position, the steering angle, and longitudinal and transverse acceleration. It thus guarantees an authentic feel while maximizing the energy saved. The next step will enable the driver to influence this interplay. Recuperation will be adjustable in several steps. The new MK C1 integrated brake system pairs Electronic Stability Control (ESC) with an innovative activation system in one compact, weight-saving unit and enables optimum support for recuperation strategies. The new development combines high braking force dynamics with precise and quiet pressure control for enhanced comfort and safety functions.